Hundreds of Israeli riot police hold back mobs of ultra-Orthodox young male protesters. JERUSALEM – Thousands of ultra-Orthodox Jews flooded into the Old City’s Western Wall plaza early Friday in a boisterous and sometimes violent protest against a group of female activists exercising a newly court-affirmed right to pray at the holy site in a similar fashion as men do. It was a rare scene of chaos, protest and sporadic clashes by Jewish worshipers in front of what most view as Judaism’s most sacred place after the Temple Mount. Dressed in black hats and coats, mobs of young ultra-Orthodox men tossed eggs, water bottles and coffee cups at members of Women of the Wall as their leaders led a group of 100 men and women in prayer. 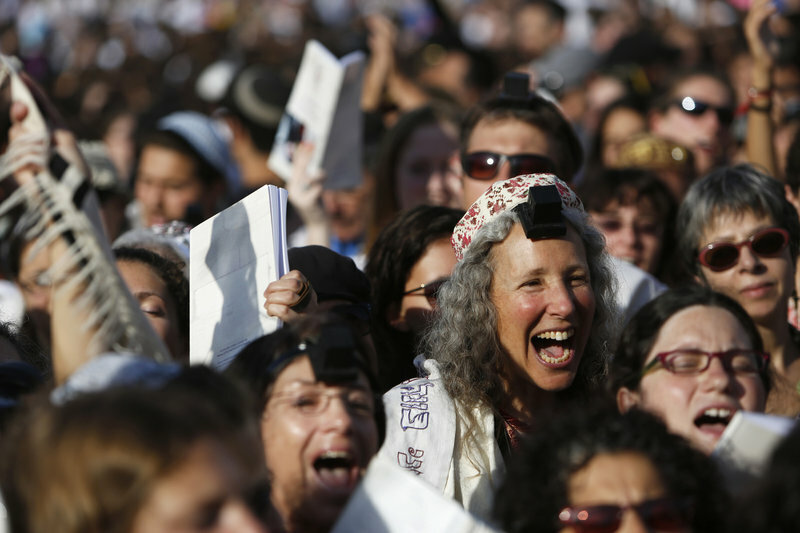 Several women from the group wore white shawls and other religious ornaments, such as black tefillin boxes on their heads, traditionally used only by men at the site. In anticipation of Friday’s service, religious seminaries from all over the country bused in thousands of girls, who filled the fenced-off women’s section of the Western Wall to prevent the activists from entering. Instead the Women of the Wall members held their service in the adjacent plaza as hundreds of Israeli riot police held back ultra-Orthodox young men who blew whistles, shouted insults and chanted in an effort to drown out the prayer. Police, whom the youths called “Nazis,” arrested five men for disrupting the peace, said police spokesman Micky Rosenfeld. As the women departed, some were pelted with rocks. Women of the Wall leader Anat Hoffman, who on Friday was being protected by the same police who once arrested her performing a similar prayer service, predicted that it was only a matter of time before women won expanded rights at the holy site. Critics accused Hoffman’s group of exploiting the issue for attention and ignoring centuries of traditions at the Wall. Until last month, women activists were often arrested at the holy site simply for wearing prayer shawls or reading from the Torah. Police said the arrests were justified by a 2003 Supreme Court ruling that said religious activities at the Western Wall should comply with “local custom,” which police based upon Orthodox practices. But on April 25, a Jerusalem judge ruled that the police had misinterpreted the Supreme Court ruling and overstepped its bounds in arresting women. He affirmed their right to continue their prayer service at the site. Perhaps fearing the Supreme Court would uphold the decision, Israel’s Attorney-General Yehuda Weinstein said last week that he would not appeal. Instead government leaders are hoping to craft new regulations on the issue and find a compromise that all sides can accept. Jewish Agency Chairman Natan Sharansky is leading a renewed effort to create a third prayer section — located near an archeological site known as Robinson’s Arch just south of the current Western Wall plaza — devoted to egalitarian services. Both sides have expressed tentative support for the idea, though it remained unclear when such a section would be completed. The compromise has been embraced by the Western Wall rabbi, Shmuel Rabinowitz, who is calling upon both sides to prevent the holy site from being used to divide Jews. He said he preferred maintaining the status quo, but did not think it was worth launching a political and legal battle against the Women of the Wall. “I would recommend not going to holy war over it,” he said. Hoffman predicted that Friday’s large ultra-Orthodox protest would backfire for religious leaders because it exposed thousands of young religious girls to ideas about gender equality that are seldom discussed in their sheltered communities.